of events Click here Presidential election debate with referendum planned for October 21 on constitutional amendment. Events in the Republic of Turkey have attracted recent media attention as potential candidates emerge for the presidential and general elections. 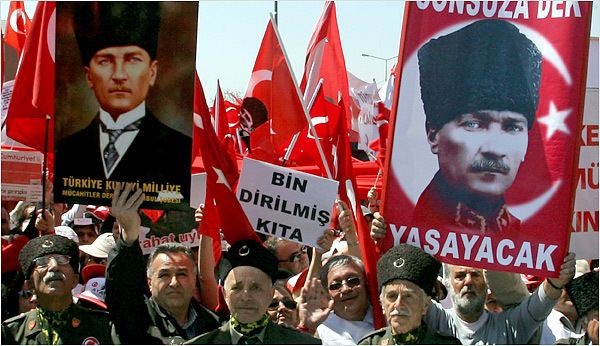 The nation has been a secular democratic republic since its establishment in 1923 under the leadership of Mustafa Kemal Atatürk following the collapse of the Ottoman empire. Today, a large segment of the Turkish population is expressing their pro-secular position as they confront threats to the secular system. 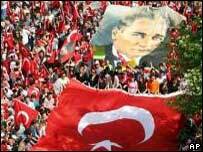 A pro-secularism rally held in Ankara on April 14 drew a crowd of over half a million. An April 29 rally in Istanbul attracted a record-breaking a crowd of over one million, while further demonstrations against anti-secular activities are being planned throughout the country. 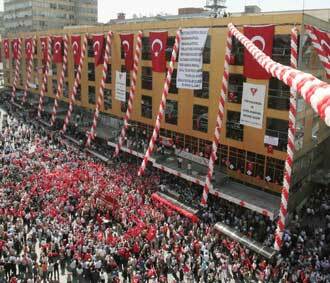 April 29, 2007 - Pro-secular demonstrations supported by nearly 600 non-governmental organizations were held in the Turkish capital Ankara, and in Turkey's largest city Istanbul, to show support for the country's secular system. 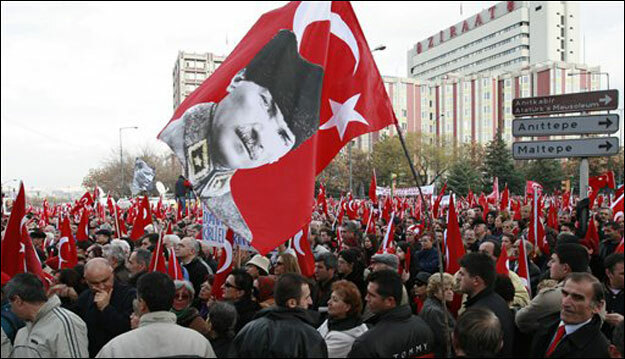 Carrying Turkish flags, the demonstrators shouted slogans to protect the country's secular foundations and the principles of Mustafa Kemal Ataturk, the founder of modern Turkey. 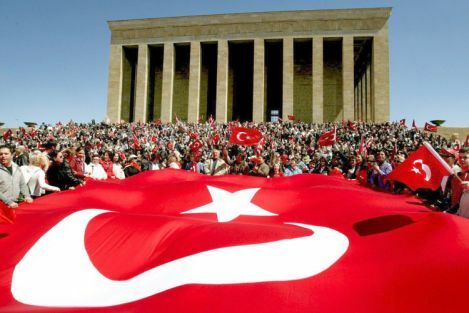 The April 29 rally in Istanbul, similar to the April 14 mass demonstration in Ankara, came amid mounting tension between the Islamic-rooted ruling Justice and Development Party (AKP) and the country's secularists. 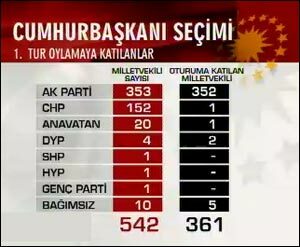 Turkish Foreign Minister Abdullah Gul, presidential candidate of the ruling Justice and Development Party (AKP), failed to garner the required two-thirds majority of 367 votes in the first round of parliamentary voting on May 27. The main opposition secularists Republican People's Party (CHP), which boycotted the vote, appealed to the country's Constitutional Court to annul the presidential vote since the parliament convened with less than 367 lawmakers to elect the new president. 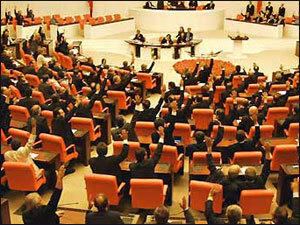 The court upheld the opposition CHP's appeal, a scheduled general election in November, will be called within 90 days. 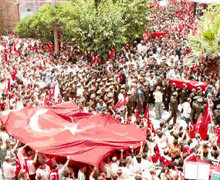 October 11, 2007 - Amid the Turkish government's efforts to take effective action against rising PKK terror (Kurdistan Workers' Party), people across Turkey gathered to condemn terror attacks, especially the recent killing of 15 Turkish soldiers. The deadly attacks on Turkish soldiers have triggered public outrage and mass public rallies in different cities of Turkey. University students all over the country participated in protests, chanting slogans and carrying banners against the PKK terror organization. For over a decade, Turkish troops have made small-scale "hot pursuit" raids into Iraq. Turkey's army staged over two dozen large-scale incursions into northern Iraq between the late 1980s and 1997. Turkey launched major incursions into northern Iraq in 1995 with 35,000 troops, and the 1997 operation involved tens of thousands of soldiers and government-paid village guards. A major offensive is now being considered by Turkey to combat the PKK terror organization in northern Iraq. As a result of the deteriorating security situation in Iraq, and the inability of U.S. and Iraqi forces to counter PKK terrorism, Ankara is backing a cross-border military operation. Over the last 10 days, more than two dozen soldiers and civilians died in attacks by PKK terrorists in the southeast. The PKK, which has been officially recognized as a terrorist organization by Washington, the European Union, and NATO, has fought Turkish forces since 1984. It is also responsible for killing civilians, targeting tourists, and conducting operations in European Union countries. PKK rebels carry out attacks on Turkish soil and then cross the border to sanctuaries in northern Iraq. For many years Turkey has sought U.S. and Iraqi assistance to prevent these acts of terror. Turkey has repeatedly accused Iraqi Kurds of tolerating the situation, and has been disturbed by the lack of U.S. action to stop PKK activitıes in northern Iraq. Under these circumstances Ankara has declared that Turkey will exercise the right of self-defense, and the right to take action against terrorism and terrorist activities. Earlier this year, General Yasar Buyukanit, Commander of the Turkish Armed Forces, stated that a Turkish military operation "must be made" to hit PKK bases in northern Iraq. As Turks vowed to fight terror, protests were held across the country to condemn a suicide bomb attack in the capital, which killed nine people and injured more than 100. Turkey for many years has warned allies, countries in the region, and the international community of the dangers of the freely operating PKK training camps in northern Iraq (which according to recent reports are now receiving weapons intended for U.S. forces in Iraq). Ankara continues to call for effective action in accordance with international and multinational agreements. While Turkey once again plans a major offensive against the PKK, it is calling upon the international community to focus on the PKK's geopolitical and economic destabilization of the region, and the new security risks posed by the PKK, if the outlawed organization's bases and global networks are not disrupted.